With prime dog-walking weather finally here, it’s a good idea to be prepared for those wet and windy days as well. 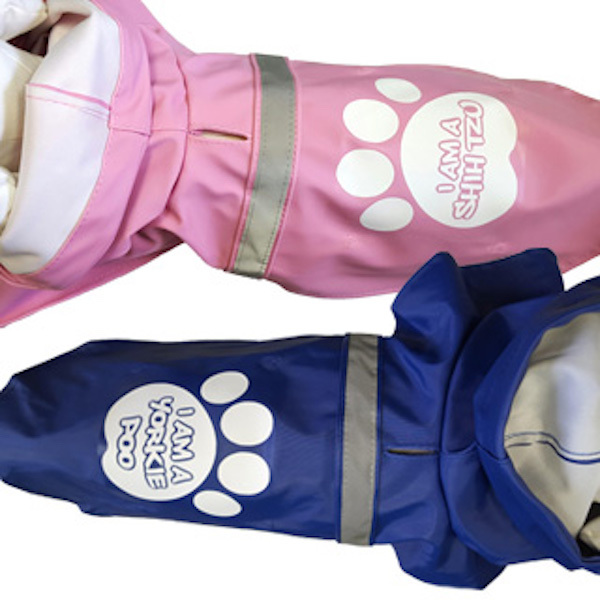 Smaller breeds can get great coverage thanks to the Deziner Dogs line of canine apparel, including new custom raincoats. Made with 100-percent eco-friendly polyester, heavy-duty vinyl construction, and a helpful reflective stripe for better visibility, these foul-weather slickers ($34.99) are built for four-legged friends and also serve a uniquely fun purpose – telling passersby what kind of pup you’re walking. The back of the coat has a classic paw print design that reads “I Am A…” and specifies the breed of your furry companion. From Cockapoo and Havanese to Tibetan Terrier and Maltese, these pink and blue coats speak for themselves while your pup stays busy sidestepping rain puddles. And good news for sweet, short-nosed pups, a portion of the proceeds from Deziner Dog sales goes to S.N.O.R.T. Rescue Group (Short Noses Only Rescue Team), a volunteer organization based in Hoboken, New Jersey, with a mission to rescue brachycephalic dogs (think Bulldogs, Boston terriers, and Pugs). So consider stocking up on other “I Am A…” doggy apparel and leashes. You’ll be keeping your pooch comfortable and dry while helping to ensure others get the support they need. The post Keep Your Dog Dry While Proudly Proclaiming Their Breed appeared first on Dogster.